The only challenge I really had was the front claws, & the legs a bit. There's a loose part on the claws that gets connected later that can be a pain in the neck, but not too difficult. There's also room for mistakes when you get to the legs; make sure you're getting the right pieces, 'cause that's where I made a mistake. His quality is excellent, & the pieces stay together very easily. I've had no problems with pieces falling off so far, even when in motion. The box was enormous in my eyes, though not as big as an HMM box. So I expected him to be pretty big. He is, compared to a Liger Zero. He stands about as tall as Liger, with his tail curled up. With the tail stretched out, he seems to almost double in length. His colors are blue & red armor with black underneath & gray claws. The head armor also reveals the dark gray head underneath, which the eyes light up when its turned on. 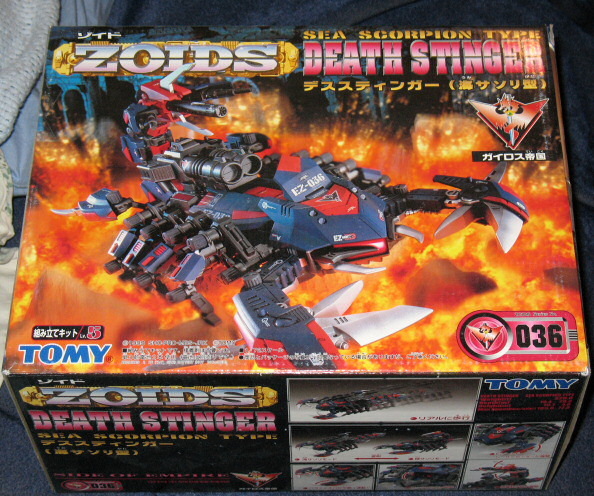 A very awesome Zoid & not too expensive if you know where to buy; highly recommended. So far, my completed model hasn't revealed any bugs to me, which is a plus right away. Maybe someone else will discover one but mine seems great all-around. The tail is pretty flexi, able to move so its straight down, & also to curl up for the infamous CPC. The blades on his front claws can move in & out as well, & the claws open & close when he walks. He just needs 2 AA batteries, which go in the cannon on his back. Careful which screw you open on there, that's another mistake I almost made. He isn't very heavy either, slightly heavier than Liger Zero. Overall a great Zoid, fun to build too. Took me an hour & 22 minutes. He's very sturdy & doesn't break apart easily, & is a must for any collection.